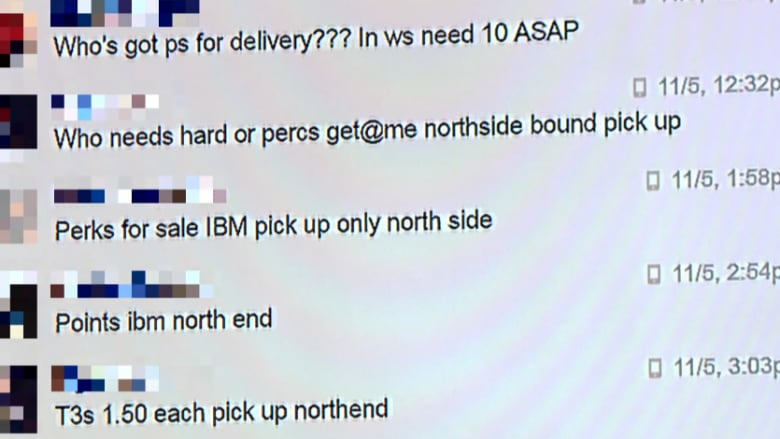 Secret Facebook group conversations where Winnipeggers are scoring drugs are still online nearly a week after the social media site was notified of their existence. CBC contacted Facebook last Wednesday about two group Messenger conversations titled "Wpg drug mart" and "ChOp ShOp." They are accessible by invitation only, but once inside members are buying and selling drugs. On Tuesday, Facebook told CBC in an email that they were still investigating the groups. However, getting groups engaged in illegal activity off of Facebook and other social networking sites is very difficult, according to social media expert. Anatoliy Grudz, director of the Social Media Lab with Ryerson University and the Canada Research Chair in Social Media Data Stewardship, says social networking websites are flooded with complaints. "We have seen the rise of bot-automated programs that propagate in spam messages. We saw the rise of trolling and cyber bullying instances. So they are flooded with a huge number of requests to block all kinds of content," he said. While pages, groups, profiles, messages, pictures and videos get flagged as inappropriate, only content that gets a certain number of reports will even be viewed by a human. Grudz added it's not as simple as creating an algorithm to flag certain words like fentanyl or crack cocaine. "I think that's very doable to create a script that automatically would look for certain keywords. But unfortunately this approach is not very effective," he said. "If you use such an approach you can find false positive results." That means groups that are also trying to discuss anti-drug policies would also get flagged using the same keywords. Although the task seems difficult, Grudz said it's not impossible if enough people report a page or a post. "Of course having pressure on Facebook to do a bit more to try and improve their algorithms to detect those groups will help as well," Grudz said. "We prohibit the use of Facebook to facilitate or organize criminal activity that causes physical harm to people, businesses or animals, or financial damage to people or businesses. We remove content, disable accounts, and work with law enforcement when we believe there is a genuine risk of physical harm or direct threats to public safety. We also refer information to law enforcement whenever disclosure is we believe it is necessary to prevent harm."